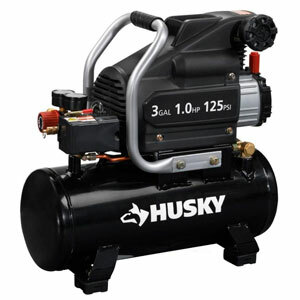 Husky 3 gallon air compressor equipped with a 1.0 HP induction engine and direct-drive pump. This 3 gal compressor has an oil sight glass which greatly simplifies the control of oil level in the pump. It delivers 2.4 SCFM at 90psi and maximum pressure 125 psi. It has couple of gauges at the top of compressor one for the line pressure and one for the air pressure. It has large rubber pads at the bottom so it can not damage to your floor. This air compressor is best fit for home and personal use. It have enough capacity air tank which can complete almost any task at home and garage. Note, that color of Husky 3 gallon air compressor may vary and may be red or black. It comes up with additional bottle of oil, so before you make first start you should: Unscrew the red cap, then put in some oil in it and screw the muffle to the right side. How long does it take to fill up its air tank? It takes around one minute to fill up it from the empty tank up to full. Everyone who has ever bought this compressor says that it’s really lightweight and powerful at the same time.